It has been announced via the Frameworks listserv that pioneering experimental animator Robert Breer passed away on Aug. 11. The news came with no information regarding the circumstances of his death. The Underground Film Journal believes Breer was born in 1926, so although we don’t know the specific date of his birth, he was either 84 or 85 years old. According to Sheldon Renan’s An Introduction of the American Underground Film, Breer began his artistic career originally as a painter, graduating from Stanford in 1949 with a degree in that field. 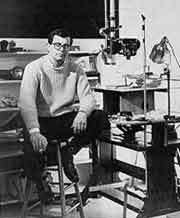 Upon graduation, he moved to Paris where he first began making animated collage films such as Form Phases I (1953). Then, he moved into line animation films, including one of his most famous short works, A Man and His Dog Out for Air (1957), which is primarily an abstract films that periodically form recognizable shapes, such as the two figures mentioned in the title. In 1959, he moved back to the U.S. in Palisades, N.Y. and made animated films that focused on or combined all of his different techniques, such as Blazes (1961) and even a “whacky live-action pop art venture called” Pat’s Birthday (1962) with Claes Oldenburg’s company of Happening performers, according to Renan. The underground is greatly involved with the act of seeing. Starting in the fifties with Robert Breer’s work and that of Brakhage, there has been a fascination with the question of how one sees, of what sight is. The concern is with both the physiological and philosophical aspects of seeing. Breer made films his entire life and even sculptures. Some of his films include Rubber Cement (1976), Swiss Army Knife With Rats and Pigeons (1980), Time Flies (1997) and Atoz (2000). Teaching animation at NYC’s Cooper Union for many years. Thirteen of his earliest films, including Form Phases I and Blazes, were included in the Anthology Archives Essential Cinema Repertory Collection in the mid-’70s. In 1987, the American Film Institute awarded him their Maya Deren Award, which was a lifetime achievement honorary award for underground and independent filmmakers. In 2009, his film Eyewash (1959) was included on the Treasures IV: American Avant-Garde Film, 1947 — 1986 DVD collection. A great artist and teacher. RIP. Robert Breer was a wonderfully intelligent non pretentious man. His very essence mocked the new facism. He is a personal hero, was a great professor and a wonderful person. The world has lost someone very important. A wise man of subtle humor… it’s great to see this recognition.